We rely on the generous support of others. Please consider donating to our organization and continuing to make our work a possibility. 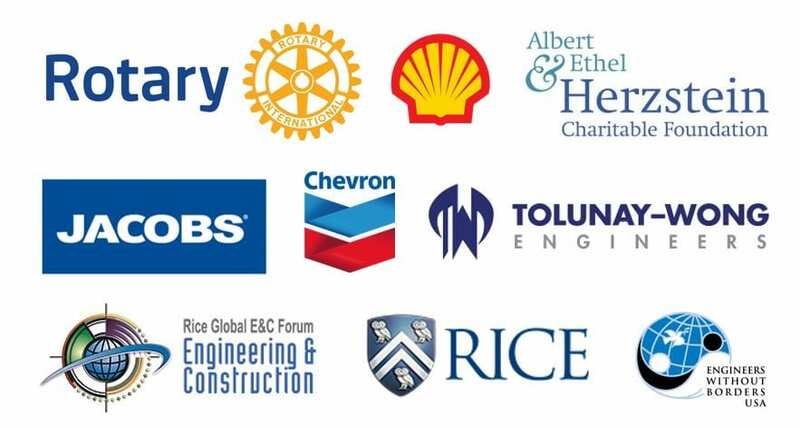 The Rice University Chapter of Engineers Without Borders-USA is a non-profit organization dedicated to making a difference in developing communities and enhancing engineering education at Rice University. All members of Rice EWB-USA are volunteers and all funding for Rice EWB-USA projects comes from contributions from supporters. Without this financial support, our projects would not be possible. Rice EWB’s annual budget is about $30,000. All donations to Rice EWB-USA are tax deductible when given through Rice University, and go directly toward the implementation of our projects in Central America. 1. You may complete this online donation form. Select “Other” in the “Designation” drop down box and enter “EWB Fund-G82080” in the “Special Instructions” box. Check the database to see if your company has a matching gift program. 2. Or you may complete this printable donation form. Please address your checks to Rice University and write “Rice Engineers Without Borders” in the memo. You may complete this online donation form.